Our two coolers on a recent outing to NJ, the Garden State. 1. Use decent coolers. In spite of being the cheapest people in the world, we do own two semi-decent coolers. I think we bought ours at the Pharmacy next to Mrs. Green’s in Ossining, NY (shout out to the Pharmacy - they have one of everything, and not too expensive). Anyway, they’re Coleman brand and they were about forty bucks each, but any heavy plastic coolers with handles and wheels and little plugs at the bottom for letting out the water will do. TIP: Coolers double as stools. 2. Take the perishables seriously. We use cooler #1 for serious perishables. It contains two plastic containers with lids, one for dairy and one for meat. On top of the two boxes goes a plastic tray, on which we put perishable condiments, like catsup. (That plastic tray was something that broke off of a piece of kid’s furniture, as I recall. You probably have something like that around the house.) Everything in cooler #1 is double-wrapped, usually in plastic wrap and then zipped into a Ziploc bag. TIP: Above all, don’t forget the salt and pepper. It’s a sad day when you can’t have a little salt on your baked potato. 3. Prepare the veggies at home. Cooler #2 is for the fruits and veggies. We always clean and dry – and sometimes cut up - all our veggies at home. This makes life a lot easier and less gritty when you’re camping. 4. Freeze everything beforehand. Before we pack the coolers, we freeze around 8 big bottles of water – you know, the Poland Spring athletic size with the tops that pop up. These go in the bottom of the coolers and any place else we can fit them. We also have quite a few ice packs we’ve collected over the years and we freeze those and squeeze them into the nooks and crannies, like inside and in between the plastic containers. We freeze all the meat, the juice if it’s in boxes, and anything else that enjoys being frozen, even the butter. This all helps to keep things cool and fresh. TIP: As the Poland Spring water thaws, you can drink it. 5. Plan your meals. We pack what we’re going to eat first at the top of the cooler. When the food is handy like that, the cooler stays open for less time, keeping the cool in. TIP: It’s really better to not have a lot of leftovers. They don’t keep that well without real refrigeration and last night’s sooty burgers are not a very welcoming sight in the morning. It’s better to figure out what you’re going to eat for each meal – more or less - and bring and cook the right amount of food. One notable exception to this rule is leftover baked potatoes, which are always a nice addition to a camping breakfast. 6. Buy ice. When we get near the campsite we buy two bags of ice and divide them among the coolers. Usually, one bag can go in whole with the veggies in cooler #2. Then we divide the other bag of ice into big Ziploc bags and strategically jam them into cooler #1, and we usually have plenty left over for iced drinks! 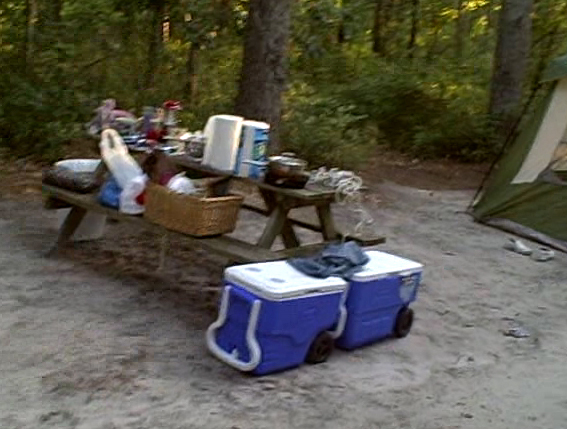 And then we just buy more ice when we need it during the trip, and we don’t open the coolers a lot. 7. Keep the coolers cool and safe. We keep the coolers in the shade during the day. And then we put them in the car at night so the dogs and coyotes and bears and possums can’t get them. 8. Keep the coolers tidy. Don't let any messy but well-meaning family members muck about in the coolers. A neat and tidy cooler is a happy cooler. 9. Don't get food poisoning. If something smells bad, it is bad. Throw it out. If you can’t smell things, have someone else smell it. Don’t get Salmonella. Please. It’s very unpleasant, particularly when you’re camping. 10. If all else fails, order pizza. The great thing about car camping like we do is that you’re never too far from pizza, ice cream or an emergency game of Pac Man. 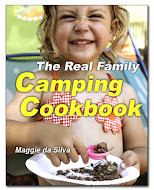 We have camped for years and I find it works well if you prepare some items at home to travel such as trail mix, coffee cake, and I brown my ground beef which I use in several recipes such as burger bundles with veggies butter and bouillon cube and we make a taco salad. I find that Tupperware containers make transport and storing (no bugs) great for camping. Something I started doing a few years ago was putting the meat in ziplock bags and then placing that inside a Rubbermaid shoe box container, the ones with the good lids. This helps keep them from getting wet if the Ziploc bag would happen to leak and also keeps them from getting smashed along with keeping it all together. Thanks for the tip, @Nicole! Awesome site! We have always used two coolers as we usually can't fit everything in one. I do employ the "chop it all at home" method rather than doing it at the campsite. That way I can just dump and cook at the site.